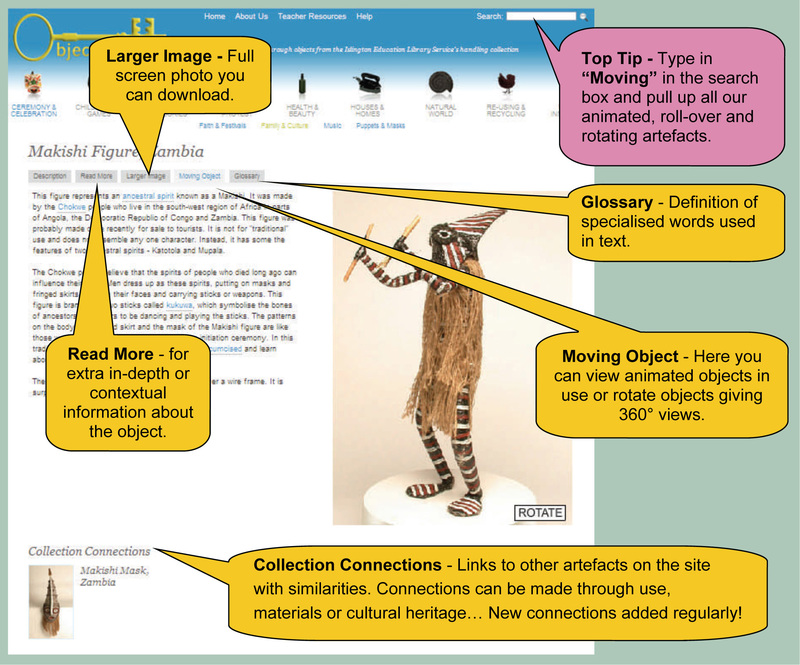 Object Lessons is an on-line display of selected objects from the Islington Education Library Service (See About Us). There are currently about 400 objects on the site and more objects, information and activities are being added. The objects are organised and displayed in nine themes: Ceremony & Celebration, Childhood & Games, Clothes & Accessories, Conflict & Protest, Health & Beauty, House & Homes, Natural World, Re-using & Recycling, and Work & Innovation. The nine themes are subdivided into different British historical periods and world. Each of the nine themes have an introductory interactive scene, showcasing some of the objects in that section. Move you mouse over the picture to find the objects. If a label or hand symbol appears you can click on the object to find out more about it. Some of the objects in the scenes are animated and show how the object works. There are also sound effects in some of the scenes. For example in the scene from the Blitz in World War II (Conflicts & Protest) you can hear the sound of a siren and bombs exploding. These are British historical periods or world. Once in a subsection you can get an overview of all the objects in that subsection as thumbnail images. Click on the thumbnail picture to reach the object page. Each object is represented with an image and general information. The information is written for the non-specialist and any technical terms are explained in a pop-up glossary box. Many of the objects have an additional level of information, which can be accessed by clicking on 'Read More' tab. Each picture of the object can be enlarged by clicking on 'Larger Image' tab to view a version without the information text. The site content is searchable. Type a keyword in the box provided at the top of the page. Relevance of the site to teaching the National Curriculum and the International Primary Curriculum. Using with an interactive white board. The website is free to access and the texts, images and interactives are copyright free for education non comercial use and can be downloaded, copied and edited in any way. Please credit Islington Education Library Service on any reproduction.